If you have a large family or a small sports team to haul around, the 2016 Chevrolet Traverse is a large crossover that accommodates seven or eight people depending on whether you go with the available captain’s chairs for the second row or standard bench. Even the third row offers a generous 37.8 inches of head room, 57.6 inches of shoulder room, 48.3 inches of hip room, and 33.2 inches of leg room. For 2016, the Chevrolet Traverse adds iridescent Pearl Tricoat and Mosaic Black Metallic while deleting Black Granite Metallic and White Diamond Tricoat as exterior colors. Also removed are the 20-inch aluminum and machined painted spoke aluminum wheels, outside heated power-adjustable mirrors with manual fold and the driver-side auto-dimming body-color mirror with integrated turn signal indicators. Additions include a Leather and Driver Confidence Package, and 20-inch painted aluminum and machined aluminum wheels. OnStar® with 4G LTE replaces the deleted Mobile Wi-Fi Connectivity Package. Now included with the Leather and Driver Confidence Package on the 2LT trim are Side Blind Zone Alert and Rear Cross Traffic Alert, the Express-Up and Down and passenger Express-Down windows, the Memory Package, outside power-adjustable power-folding mirrors, and driver-side auto-dimming body-color mirrors with integrated turn signals. White has been renamed to Summit White. Standard on the entry level LS trim, which has an MSRP of $33,205, are black outside power-adjustable mirrors, 17-inch steel wheels, the Color Touch radio with a 6.5-inch diagonal touch-screen display, single-zone manual air-conditioning, and seating for eight. As the driver, your seat adjusts manually in four ways and the steering wheel features the urethane comfort grip. The 1LT trim costs $36,005 and adds fog lamps, heated outside power-adjustable body-color mirrors that integrate turn signals, 18-inch machined aluminum wheels, and a front center air bag for the airbag system. The driver here gets eight power adjustments and a steering wheel wrapped in leather. Remote Start lets you start your vehicle from afar using the extended-range Remote Keyless Entry fob. For $38,505, the 2LT trim gives you the Chevrolet MyLink® Radio, the Bose® premium 10-speaker audio system, rear seat audio controls with headphone jacks, automatic tri-zone climate control, an auto-dimming inside rearview mirror, heated front seats, and seating for seven. The power rear liftgate opens and closes with the push of a button on the Remote Keyless Entry fob, the interior center console, or the touch pad of the liftgate handle. The top-of-the-line LTZ trim is priced at $44,145 and puts turn signals and Side Blind Zone Alert on the outside heated body-color power-folding mirrors. The driver side mirror gets auto-dimming and position settings for the memory. The machined aluminum wheels are sized at 20 inches and the body sides are accented with chrome. Navigation comes standard and so does the Memory Package, an eight-way power-adjustable driver seat with memory, a heated steering wheel, and power windows with driver Express Up and Down. 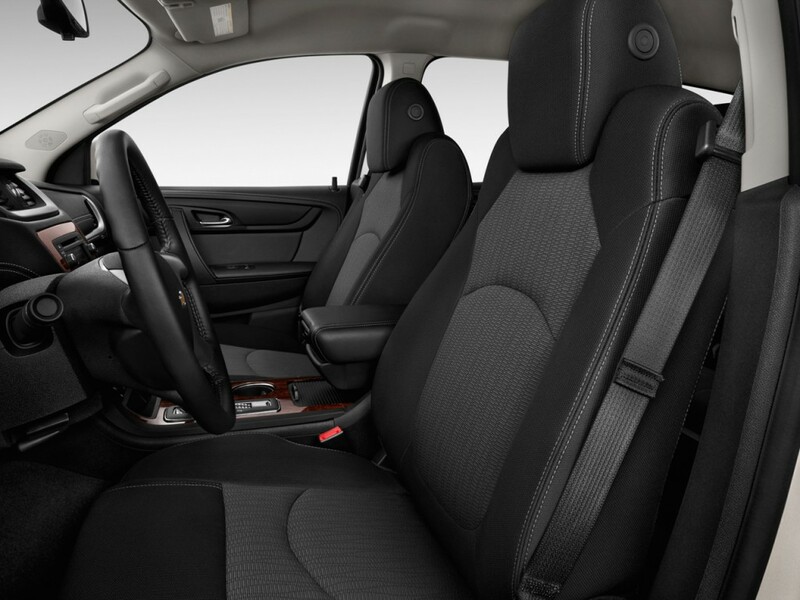 With all three rows up, the 2016 Chevrolet Traverse maximizes the total passenger volume of 150.8 cu. ft. with 24.4 cu. ft. behind the third row. Fold that row down and you get 70.3 cu. ft. behind the second row and when you fold that down, you max out cargo capacity to 116.3 cu. ft. Through the available Chevrolet MyLink, you can connect your compatible smartphone and issue voice commands, make phone calls, and play your musical files. Including the available Navigation feature gives you GPS navigation through 2D and 3D maps and a three-month trial subscription to SiriusXM NavTraffic. Expect 281 horsepower and 266 lb.-ft. of torque with the standard 3.6-liter V6, which can tow up to 5,200 lbs. when the vehicle is properly equipped. Using the standard six-speed automatic transmission, the EPA-estimated fuel economy reaches up to 22 MPG on the highway and 14 MPG in the city with both the front-wheel and four-wheel drives. The standard StabiliTrak® stability control system helps you maintain control during sudden maneuvers such as emergency lane changes, especially on roads with low traction. You don’t have to pump the four-wheel antilock disc brakes during hard stops to prevent locking up. Sensors in each wheel monitor for lockup conditions and prevent that from happening by alternately squeezing and releasing the calipers on the discs many times a second. You then maintain tight control, giving you more maneuverability for avoiding hazardous conditions. The national Highway Traffic Safety Administration awarded the 2016 Chevrolet Traverse its highest five-star safety rating with five stars for front and side crashes and four stars for rollover crashes. Constructed of high-strength materials to guard against injury to passengers, the vehicle features the Lower Anchors and Tethers for Children system for securing child safety seats and six standard air bags, including a Front Center air bag that inflates between the front seats for added protection. During an accident, OnStar® with Automatic Crash Response connects you to a human advisor who relies on GPS technology to send emergency help to your location immediately. Available Forward Collision Alert warns you if you’re approaching the traffic in front too quickly. When you change lanes, available Side Blind Zone Alert signals if a car enters your blind spot and when you go into reverse, Rear Cross Traffic Alert tells you about vehicles crossing your path. Making you feel safe and keeping the ride stable because of its suspension, the 2016 Chevrolet Traverse measures 203.7 in. long and 69.9 in. high, with a wheel base of 118.9 in., and contains a track width of 67.3 in. in front and 67.10 in. in the rear. This imposing size and wide turning circle makes for ponderous handling. Acceleration is adequate for everyday errands but lacks the power needed for immediate faster speeds, such as when passing on the highway. 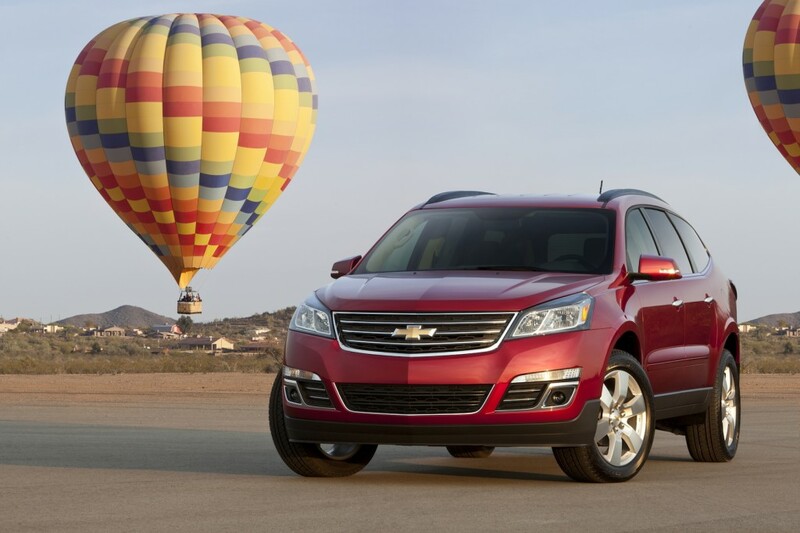 Thinking of buying a Chevrolet Traverse? Already own one? Leave a comment and let us know what you think!